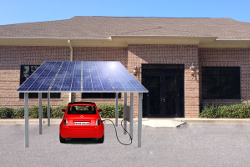 Charge your Electric Vehicle with the sun! Electric Vehicle's (EV's) are a great way to reduce fuel usage and costs. Did you know how you charge your EV is just as important? 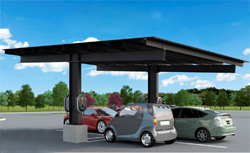 If you are currently charging your EV by plugging into your home or business's power from the grid you are utilizing power from large power plants that use resources such as coal to create electricity. Charging your EV with coal power defeats the purpose of driving an EV and increases your carbon footprint. Charge your EV with renewable energy and make your effort count! Provides shade for your vehicle; protecting it from weather elements such as the sun, rain and hail. Makes a marketing and/or PR statement by boosting your sustainability message. Can offer a platform to install solar if your roof is not large enough or space is limited. SP&LTM offers turnkey solar solutions; analysis, design and installation.